Have you ever enjoyed such a high-jinxed evening of lost inhibitions due to the liberal consumption of alcohol-laced niceties, that attempting to climb aboard one of those rocking, betuned children’s rides seems like a good idea? I have. 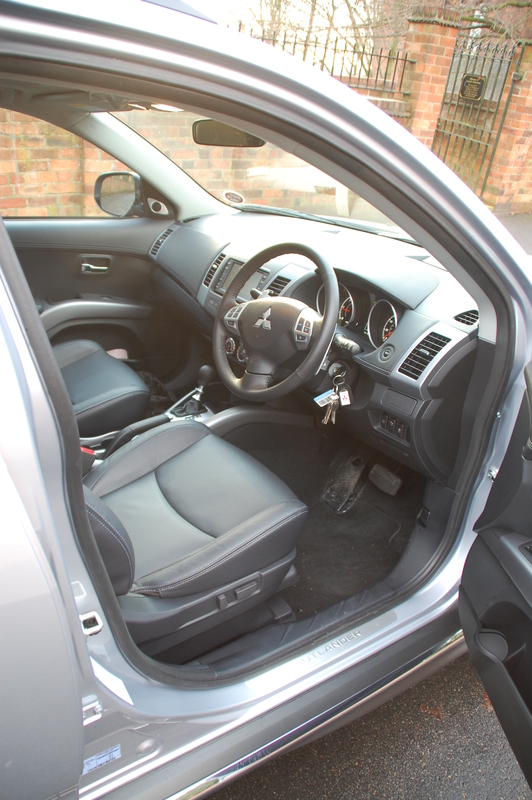 And as a six foot male of substantial structure, there was an inevitable sense of déjà vu as I attempted to ensconce myself within the rearmost row of seats of Mitsubishi’s Outlander. Why so? 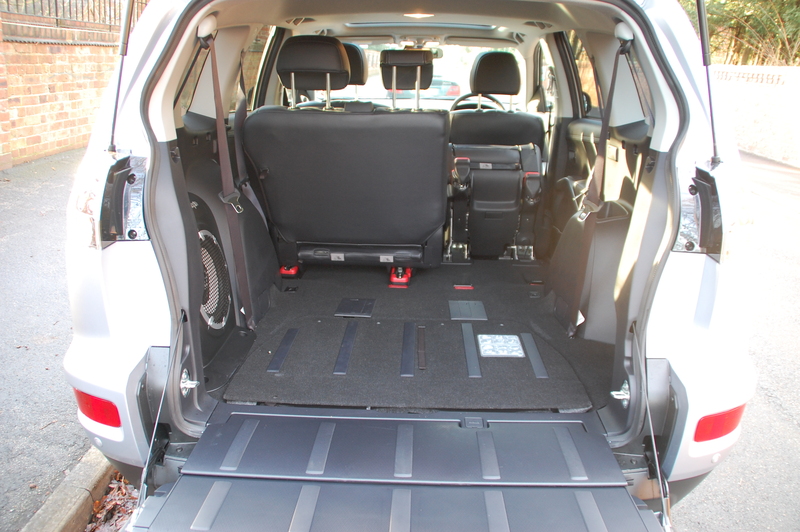 Well, although the Outlander is a seven-seater crossover, it’s best to think of it as a 5+2 – comfortable chairs for five adults and a jump seat for two small ones where the boot would normally be. 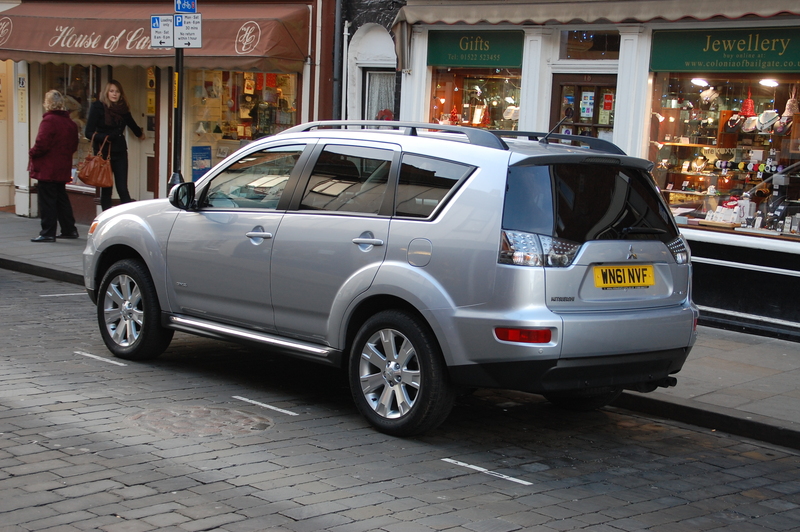 During its week with me, the Mitsubishi doubled as an impromptu minibus transporting six women to a Christmas party. A glamorous combination of high heels and short dresses ensured those relegated to the third row quickly became expert contortionists. The seat itself is a neat example of metal and fabric origami, popping in and out of the boot floor, providing a flat load space area when it’s not in use. But when it is, even kids aren’t likely to find it that comfortable over long journeys. The backrest is made of a slim line cushion and two enormous, but thin, head restraints; the base seemingly hammock like as the dark felt fabric is stretched around the metal framework. Erecting and folding the seats feels a touch Heath Robinson, utilising a series of canvas straps to pull on for the various stages of the operation. 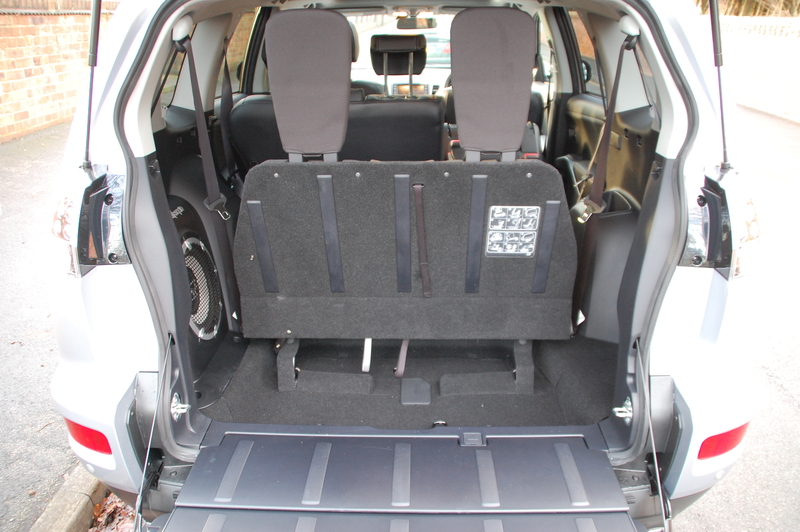 This is in stark contrast to the leather upholstered middle row bench, which can self-fold and tumble after the electric actuators are controlled via a pair of switches in the boot. The middle row of the Outlander’s seats are more comfortable than their board flat appearance suggests, with extra space being liberated by sliding the squabs back and forth and manually reclining the backrests. 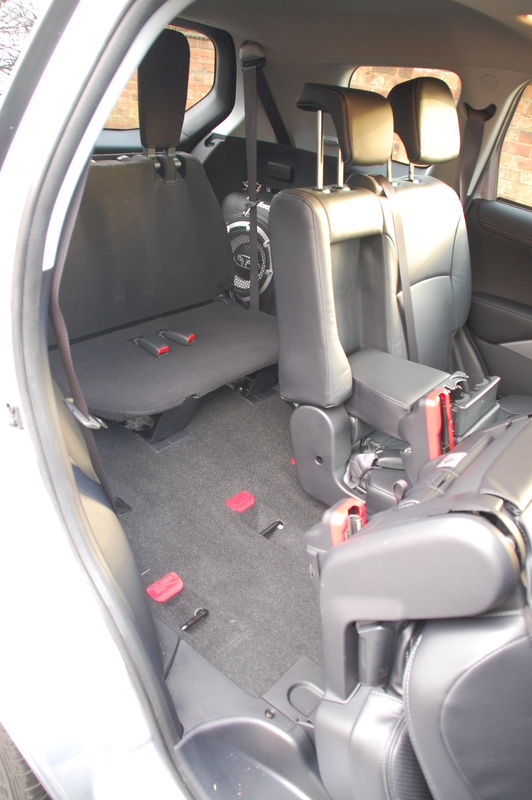 The middle seat has a functional annoyance which isn’t unique to Mitsubishi, but it’s particularly frustrating in a car aimed at larger families: the centre seatbelt has to cross over the path of the nearside position’s buckle, making accessing the belt awkward if there’s a child seat to the left. By far, the front seats in this Mitsubishi are the best place to be. In highest specification GX4 trim, the hide–covered chairs are heated and, on the driver’s side, electrically adjustable, proving comfortable and welcome on the chillier mornings that have become fashionable in recent weeks. It’s a commanding vista from the front too, providing excellent visibility due to the generous greenhouse and a panoramic ability to spot movements of other drivers because of the Outlander’s height. 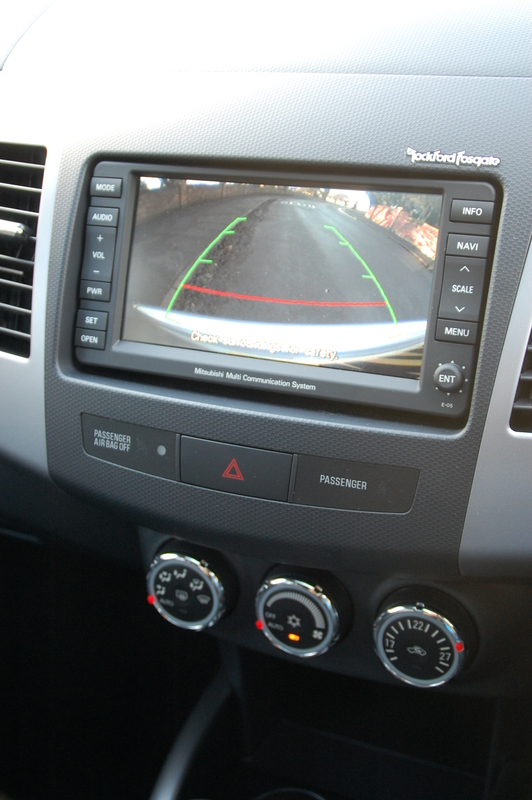 Rearward vision is excellent too, with door mounted mirrors bigger than many you’ll find in a domestic bathroom and supported on this GX4 model by a rear view camera – the fisheye display appearing on the infotainment package in the top portion of the dashboard. 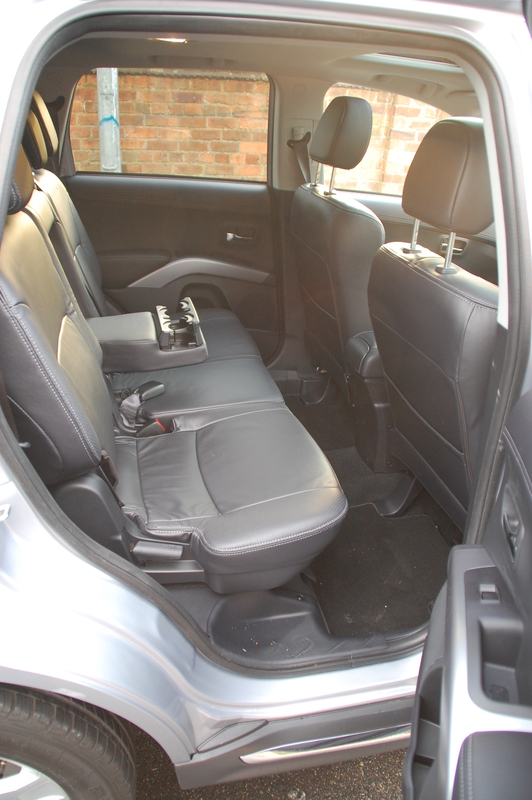 The Outlander is a well-constructed, tough feeling SUV but some of the hard plastics that embellish the interior do feel disappointingly cheap for a car costing in excess of £30,000. Some relief has been provided with silver plastic trims to accent various areas and break that charcoal grey monotony, whilst fingertips will quickly hunt out the lightly padded leathery finish to the dash mouldings and door roll tops. Toy fiends will enjoy the Mitsubishi’s generous spec list. Additional to that already mentioned, the Outlander GX4 comes equipped with all round electric windows, electrically operated and folding mirrors, cruise control, trip computer, Rockford Fosgate stereo with Bluetooth, MP3 and satnav functionality, shift-on-the-fly four wheel drive, cruise control, electric glass sunroof (rare fitments these days) and climate control. Despite the tough, SUV appearance suggesting go anywhere potential, the Outlander has a car-based platform, rather than the more off-road focused framework of the larger Shogun range. In fact, this Mitsubishi shares some chassis componentry with the Jeep Patriot, as well as more obvious links to its close cousins the Citroën C-Crosser and Peugeot 4007. The French-branded twins are built by Mitsubishi and visually distinguished by their nose designs and rear end décor. The Outlander was launched back in 2007, initially with a softer nose design than the Evolution X inspired trapezoidal blackness now adorning the prow. From the front, it suits the angular styling and mimics the shape of the third side window, but viewed from the side, the front overhang looks ill-proportioned and long – a necessity in order to get many cars through pedestrian impact regulations with flying colours. The body sides are essentially plain, relieved by a pair of bulging wheel arches on either side but at the rear, some styling flair has been allowed to erupt. The tailgate is a Range Rover-style split affair, with the lower portion aiding luggage loading and providing a convenient seat for sipping Pimm’s whilst watching polo. Or maybe drinking coffee from a Thermos on an A66 lay-by. The monochromatic tones of the heavily tinted rear screen and grey rear lamp lenses is only broken when the lights themselves are illuminated. The brake and tail light combinations are red LEDs which emerge from the dimpled finish in the upper quadrants of the clusters. Overall the styling is inoffensive but dull. The smaller ASX is hardly a design revolution but it looks tauter and bristling in visual drama compared with its larger relation. Outlander out-classed on the road? Dynamically, tall estates riding on softer springs to aid (limited) cross country activity and chunkier, high profile tyres, are always going to feel less in unison with the road than a conventional car and the Outlander is no different in this regard. This version is saved somewhat by its switchable four wheel drive function, as the additional grip provided by drive going rearwards aids cornering security. I’d recently sampled a front-wheel drive only Outlander and there’s a very clear difference in the way the cheaper model felt tackling winding back roads; the less expensive version didn’t inspire as much confidence going into bends and tended to want to let go and break away into understeer much sooner. The four wheel drive version has three settings for its driveline, activated by a rotary knob behind the gear lever. It can be switched from front wheel drive, through automatic 4WD (the rear wheels being sent power when the fronts lose traction), to locked 4WD. The price of the extra grip afforded by having all four wheels driven is extra fuel consumption. I drove most of the week in 4WD only mode averaging a shade under 30mpg, some 9mpg shy of the official claimed average figure. Although the Outlander tends to suffer some body roll in the bends due to its height and spring rating, it’s not disconcerting and never feels wayward or wallowy. Those softer settings and high sidewalled tyres ensure that ride comfort over rutted urban thoroughfares is refreshingly good. 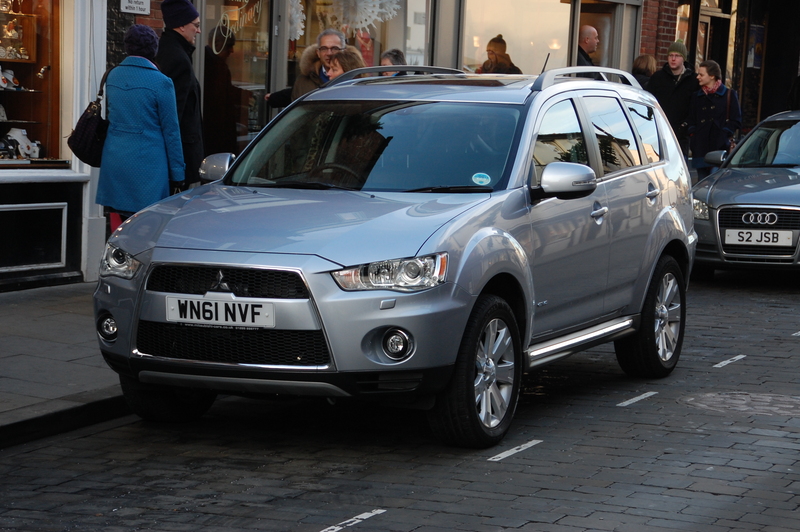 And this isn’t to the detriment of the ride quality on dual carriageways either, where the Mitsubishi remains composed. 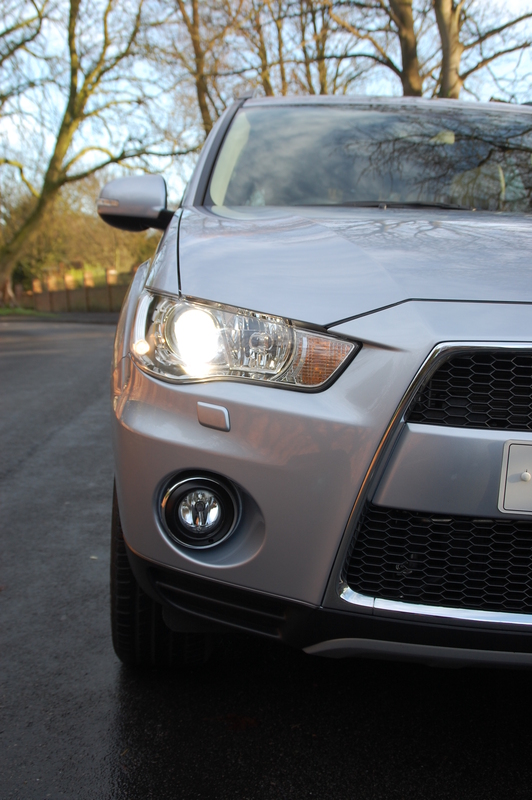 During a week of tackling different road surfaces at different speeds, the only combination that unsettled the Outlander were badly surfaced roads at 50mph plus – the rate at which the damping action needs to alter to deal with rough-smooth-rough was more than the system seemed able to cope with. Lower the speed and the sensation is reduced considerably. 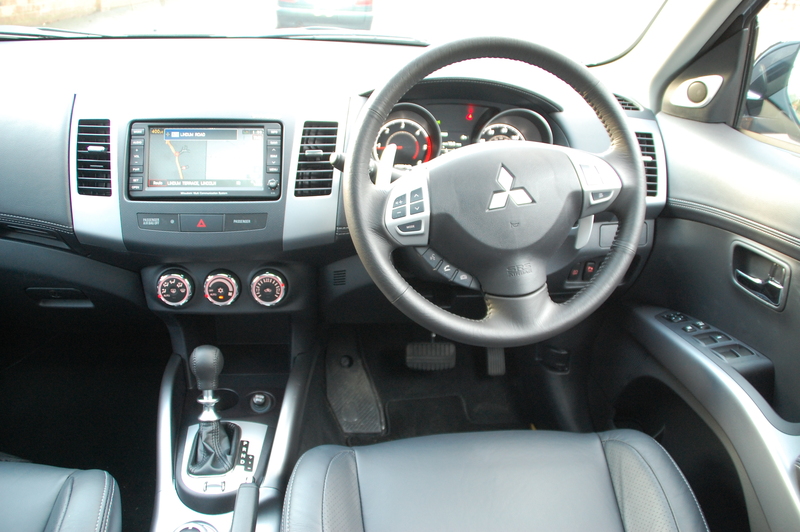 Progress in the 1¾ tonne Outlander is sedate with its 2.2-litre turbo diesel engine, in this case mated to a dual-clutch manual gearbox, SST in Mitsuspeak. It can be driven in full automatic mode or flicked up and down the ratios using the same design of steering column paddles as in the Evo X. Here they feel an unnecessary frippery. Traditional manual gearboxed Outlanders gain a healthy 20bhp over the automatics but are best avoided unless you really need to maximise fuel economy. The six-speeder is stirred into life with a long-throw lever making it feel like you were rowing it between gears and feels archaic alongside the double-clutch arrangement of this one. 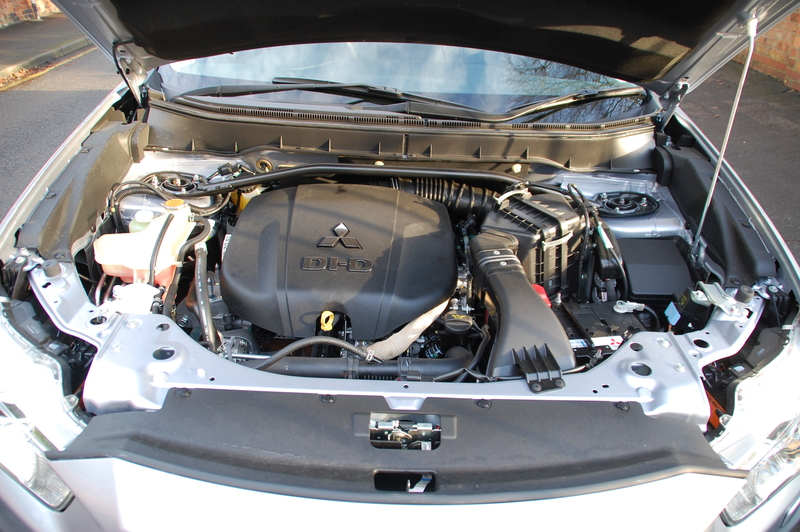 Although torquey with a strong pull across the rev range, the Outlander’s engine possesses a diesel clatter of yesteryear, more prevalent on cold start-up but never entirely escapes the under bonnet acoustics. Thankfully, there’s plenty of sound deadening to prevent much of it permeating into the cabin. Outlanders come in three levels of specification – GX2, GX3 and GX4, all of which are well equipped. It’s worth noting though that the GX2 only has five seats but because of its standard 4WD fitment is not the cheapest version on offer. Prices range from the 2WD manual gearboxed GX3 at £20,999 rising to £30,399 for the model tested here. 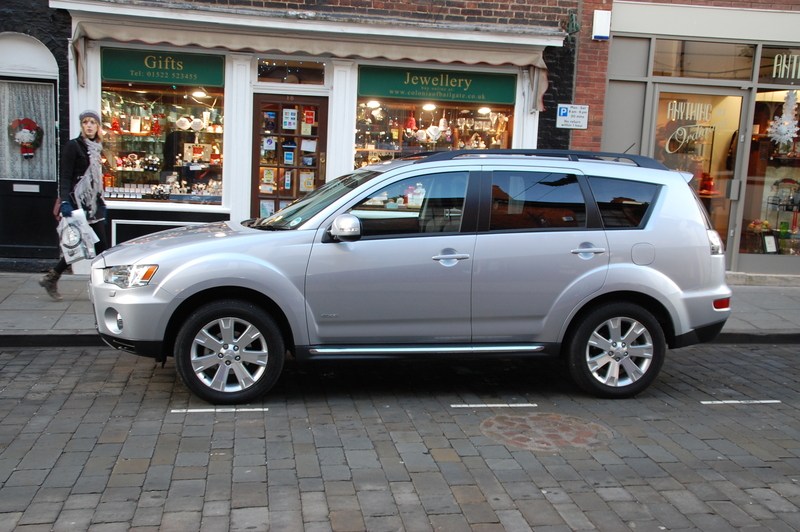 Mitsubishi’s Outlander is spacious and flexible, with seating for up to seven passengers or five with a generous boot. In GX4 trim it’s very well equipped too, ensuring you’re unlikely to feel short-changed in the buttons for Pounds stakes. Although the Outlander’s not been put through the rigours of a Euro NCAP assessment, it’s packed with airbags for passive safety and its combination of four wheel drive, traction control and a high-rise driving position will ensure that dangers are spotted and potentially avoided sooner. 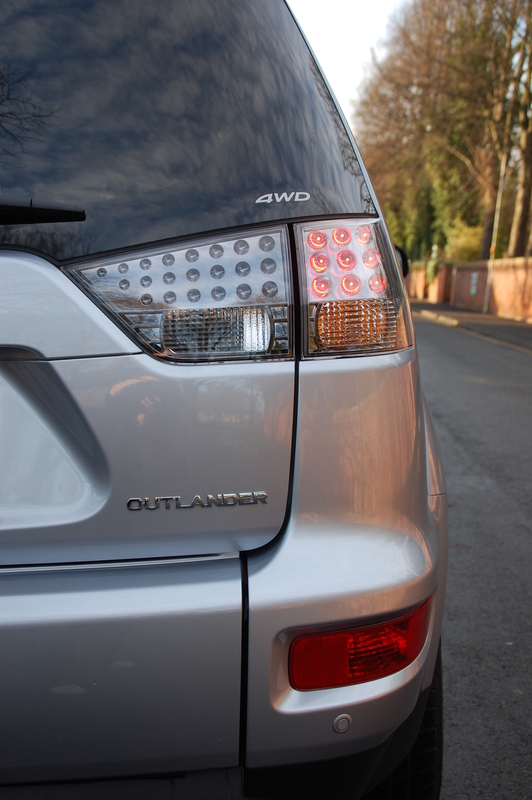 Fitted with the dual-clutch gearbox, the Outlander is much more civilised to drive than its manual counterpart but fuel consumption suffers, so get used to hunting out the cheapest diesel in your area more frequently. Do you see a car that shouts 'want me' or one that would fit logically into your family's life? The Outlander’s not a car without ability or practicality and Mitsubishi’s strong reputation for reliability is likely to prove durability’s a quality too. It just doesn’t do anything particularly brilliantly and consequently I found it difficult to warm to as a car I wanted or chose to go out for a drive in, just for the pure joy of it. 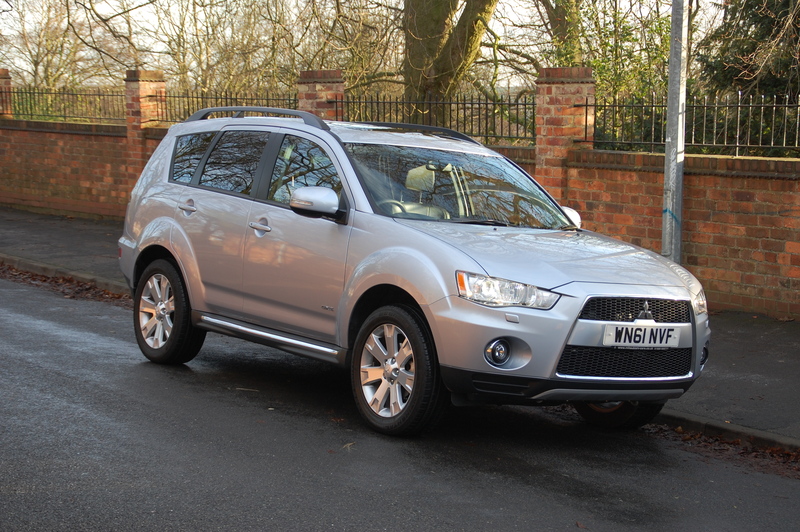 In the most part, the Mitsubishi Outlander is a car that will be chosen by the head rather than the heart and wherever that occurs, it’s a sensible proposition. Cars like the Evolution X and even the i-MiEV, show that Mitsubishi knows how to do emotional attachment. On that epic list of standard features, desirability is conspicuous by its absence. Though the engine options in Outlander aren’t very strong, it has sharp and sporty handling that is rare in the comfort oriented vehicle’s segment.